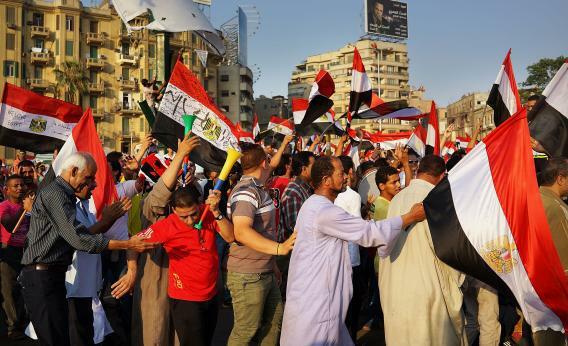 Egypt protests: The Muslim Brotherhood and the military have a showdown. Isn’t the Showdown Between the Muslim Brotherhood and the Military Potentially a Good Thing for Egypt and the World? Thousands of Egyptian protesters celebrate in Tahrir Square as the deadline given by the military to Egyptian President Mohammed Morsi passes on July 3, 2013 in Cairo. “Potentially a good thing?” Sure, it could turn into a great thing. But it could turn into an even uglier thing, too … potentially. Right now, the Morsi government is having a hard time governing. The Egyptian economy is in the toilet; its stock market is dropping; its currency is being devalued by the hour. Egypt earns between 33 percent and 50 percent of its income from tourism and related industries. Tourists, wisely enough, are staying away from Egypt. Appointing a minister of state who is a member of the group that gunned down dozens of tourists in Luxor a decade or so ago somehow does not inspire tourists to visit. Crazy, I know, but there it is. Even with the minister resigning, tourists just aren’t keen on getting caught up in chaos. The young American NGO worker who was killed while photographing demonstrations serves as a reminder why even innocent by-standing isn’t a guarantee that you’ll walk away alive. The Egyptian Army is a powerful institution. Its involvement in getting rid of the Mubarak regime was important. The Morsi government sure recognized the power and got rid of the top echelon of military officers in order to pull its teeth. That worked to move the military to the sidelines for a while. But then things changed. Morsi has not shown himself capable of reining in the extremists who march under his Islamist flag. Christian Copts have been the target of attacks. Shiite mosques and people have been attacked, burned, and killed. Another group doesn’t like Egypt’s treaty with Israel and is working hard to annoy the Israelis sufficiently that they go to war with Egypt—I guess the idea is that if Israel attacks, all Egyptians will suddenly realize that extremism is the only solution. A sufficient portion of the Egyptian population has had enough of Morsi and his governance/government. Millions took to the street in protest. The real threat is that Egypt could collapse into chaos, with no one able to exert any control over anyone. This is what the military fears. But what, actually, can the military do? It wasn’t capable of (or interested in) forming a military government when Mubarak left the scene. Is it any more capable now? The military itself is rent with discord, with strong Islamists at one end of the spectrum and secularists on the other. Can soldiers be trusted to follow orders if those orders run against their political and/or religious preferences? One would hope that the military is professional enough to follow lawful orders, regardless of the politics, but I’m not sure that’s a safe bet. The Army could overturn the government. It could gain control of the streets. But then what? It could well find itself the enemy of both Islamists and secularists. If the army does step in, things will certainly change. Whether they change for the better or worse is anyone’s guess. Why is Al Jazeera important for Westerners? Do Egyptians really blame the US for the rise of the Muslim Brotherhood?